Sleeping off the previous night’s fun with the curtains drawn tight, dawn came and went unbeknownst to Matt and me, as did my second chance to watch the sunrise over the Parisian landscape from Montmartre. Also disappearing in the early morning without a trace were Melissa and Jovanka who had a pre-dawn train to sweep them off to the next city on their whirlwind European tour. Summoning the energy from an unknown place, we arose just in time to catch the last five minutes of the complimentary hostel breakfast. Chugging down coffee and munching on croissants like they would be our last, we schemed about the day to come. Being like-minded people, Matt and I wanted to approach our exploration of Paris in much the same way, with our focus on good drinks, food and outside scenery; and largely in that order. So it was, our Saturday in Paris had begun. Expecting the automatic reflex of a deep squint when first emerging from the darker inside of the hostel, we were pleasantly, though admittedly oddly, surprised to see that it was slightly overcast outside. 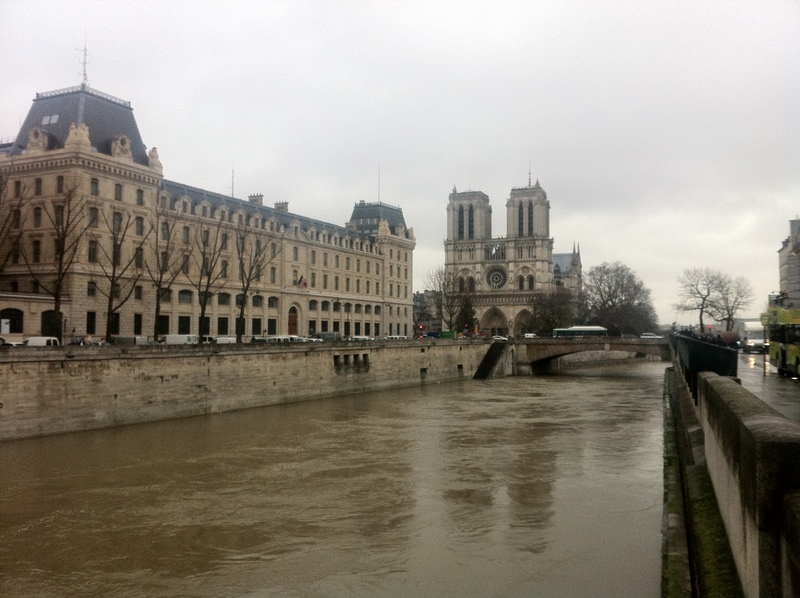 We set out on foot heading north to the Anvers metro stop, as the decision had been made to head in the direction of the Notre Dame de Paris Cathedral. As a brief side note, the name Anvers is pronounced with a silent “S” on the end; this was a common occurrence that I noticed throughout my visit in France. It seems to me that the inclusion of this consonant at the end of any word is completely pointless, as they never seem to pronounce it. Let’s look at a few examples that I have pulled from various Paris Metro station stops, of course there is Anvers, then Ternes, Courcelles, Villiers, Jaures, Couronnes, just to name a few. How much ink, let alone the wasted brain energy and embarrassment of foreigners, could be saved by simply dropping the “S” altogether? Perhaps a nod to the thirty-five hour workweek they enjoy. “Well…we drop the s from the end of all our words, why not also drop the last five hours of each workweek?” It’s my recommendation that the French government forgoes the next round of austerity measures and simply stops printing that final “S.” This would undoubtedly save the French economy truckloads of money each year and be a Godsend to students around the world who are learning French. Anyway, back to the task at hand. 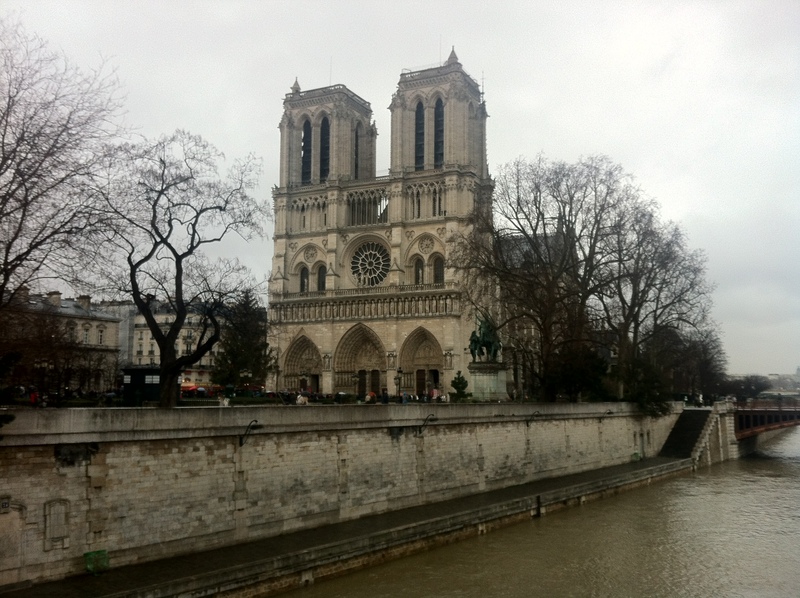 As Matt and I perplexingly discussed the pointlessness of the French “S”, we made the executive decision to get off a few stops early in route to the Cathedral so as to take the added opportunity to walk around a bit in that part of the city. 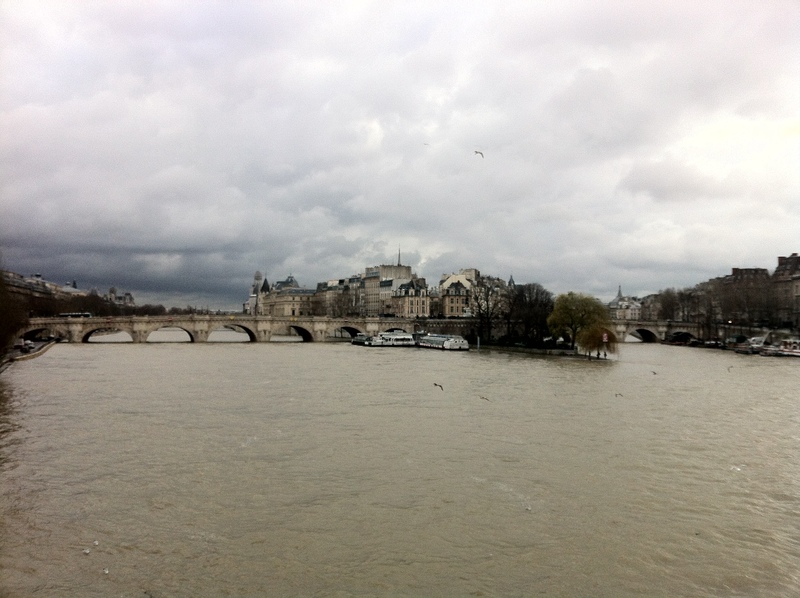 The grey sky began to sputter drops of rain as we crossed the Seine River heading south, entering the westerly tip of Île de la Cité. Strangely, neither of us was bothered by the rainy weather. In fact, we welcomed it, as the addition of rain somehow enhanced the experience of being there. After the fact, I more recently watched a movie titled Midnight in Paris, directed by Woody Allen, starring, among others, Owen Wilson. Owen, playing the role of Gil Pender, regularly remarks how his favorite thing in the world is walking about Paris in the rain. Though a little chilly when I experienced it, I can certainly sympathize with his sentiment. Regardless of the chill, our souls were unexpectedly warmed as we crossed Pont Neuf and a father began whistling La Vie En Rose to his two young boys. What a great moment! As Notre Dame came into view we decided that all of this walking around was making us hungry, so we decided to look for an appealing place to rest and enjoy lunch. Craving the ethnic food that we can scarcely find in our small Romanian villages, we meandered for a while looking for something just right. As it turns out this is one of those times where “it’s the journey that matters not the destination.” Though we didn’t find an answer to our craving, we did find a wonderful maze of cobblestone side streets packed with small cafes, restaurants and shops. It was the type of area I could imagine happily walking through every morning on my way to work. Still quiet after breakfast but before the lunch rush, shopkeepers were sweeping the streets and restocking their produce. Perhaps an ethnically Greek area, such options were in abundance, but too close to the Romanian cuisine we are all too familiar with. Instead we decided to satiate our craving for something Asian later and instead opted for atmosphere, vying for a place with a view of Notre Dame. Looking like the confused tourists that we were, unable to decide on which street-side restaurant to settle on, the decision was made for us as a waiter insistently ushered us inside Cafe Le Petit Pont. Beneath the heat lamps and yellow awning, we quickly perused the mediocre tourist-slanted menu, made up our minds and summoned the waiter over. Sadly, somewhere lost in translation our quintessentially disgruntled French waiter misunderstood our order and brought us both the same open-faced chicken and cheese sandwich (which turned out to be positively dreadful) with steak fries that Matt had ordered. 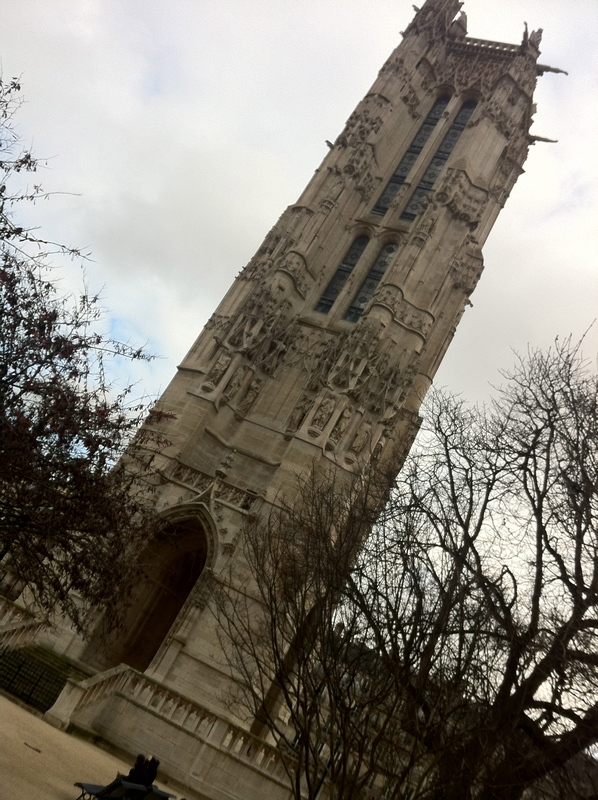 Not to be deterred, we chalked up the mistake and rudeness as part of the experience and happily finished a bottle of Loire Valley Sauvignon Blanc while noshing on fries in the shadow of Notre Dame. This is probably as good a time as any to point out the emphatically inaccurate stereotype of French rudeness. Though we encountered the phenomenon in this little touristy restaurant, it was the only time in the entire trip and seemed somehow forced and unnatural at the onset, as if more for show than actual disdain. In fact, throughout our trip we experienced nothing but the most pleasant of French citizens and impeccably gracious hosts. Reenergized with carbohydrates and flush with white wine we took our touristy photos of Notre Dame and continued our tour of the city. Heading north again, back across the Seine, past the Palais de Justice, in the direction of Les Halles and happening across Saint-Jaques Tower along the way. The irony of all this is that, again, we didn’t really have a plan, thus we, perhaps regrettably, walked by many iconic places admiring them for one reason or another but often not having a clue of the real significance until a later Wikipedia search. It’s as though we didn’t want our adventure to be spoiled with the chore of research and the diligence of facts. We simply wanted to take it all in naturally and appreciate the city and landmarks for what they aesthetically were. It was with this in mind that we consciously made the decision to admire the Louvre from the outside. This may seem somewhat sacrilegious for a former art student, but the prospect of viewing an endless amount of art among the droves of tourists wasn’t the least bit appealing. So, we momentarily gawked at the gawking tourists while standing next to the iconic modern glass pyramid surrounded by the 12th century Parisian fortress and decided in near synchronicity that it was time for some vin chaud. Thus, in search of an early afternoon elixir we set off across the Jardin des Tuileries and found a great outdoor café right in the middle of the park that had just what we were looking for. We took our seats at a small metal table nestled under perfect rows of young maple trees and placed our order. At this point the clouds gave way to sunshine, which helped create another great memory. 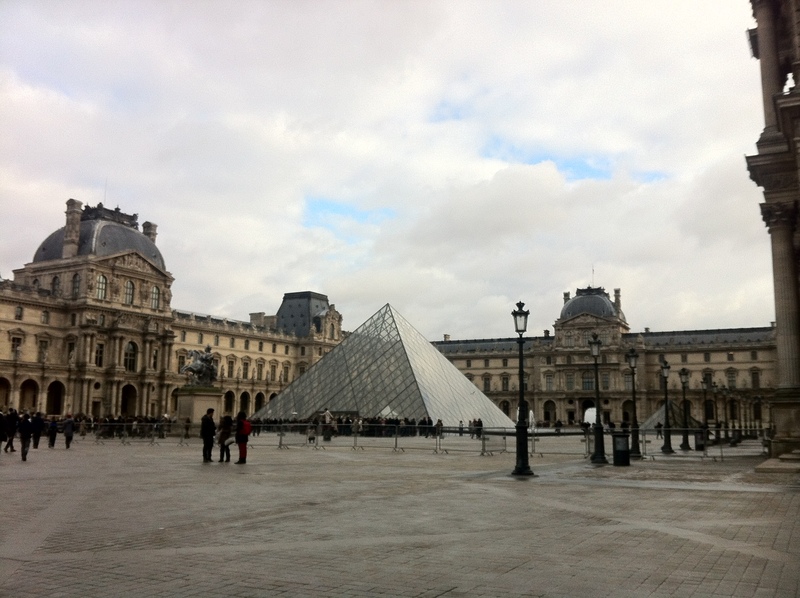 As the air around us became spring-like, we watched a nearby pair of grandparents wrangle three tow-headed blonde toddlers, as we sipped our drinks; all within view of the Louvre. It became immediately clear that life is indeed quite good. Pressing on from that perfect moment, the sky voiced its disapproval by rolling in another swath of grey clouds. 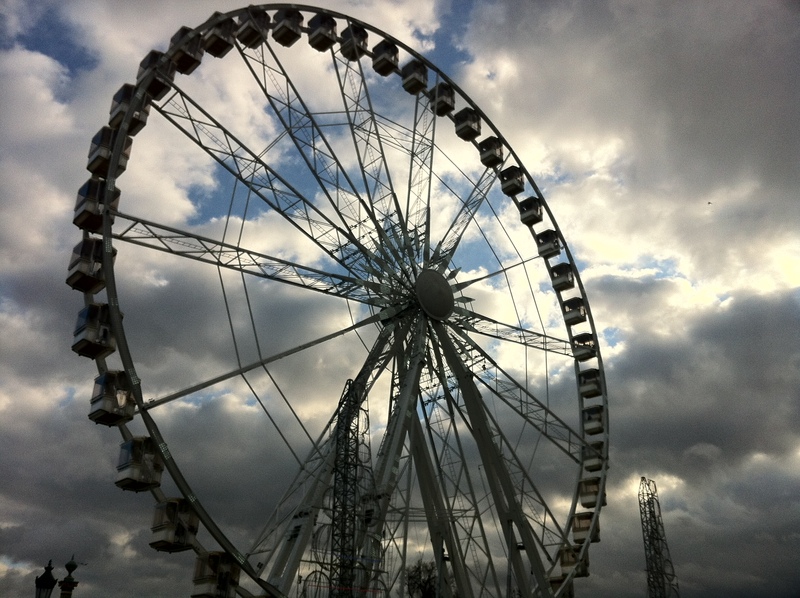 At the western foot of the Jardin des Tuileries is what appears to be a permanently installed tall, white ferris wheel, actively taking patrons up for unobstructed views of the city. Matt and I took the moment to compare it to the underground ferris wheel we had ridden in the salt mines of Turda, Romania. Though the thought of an underground ferris wheel might seem interesting, and, in fact, is,my money says that this Parisian counterpoint has slightly more breathtaking views. This spot marks the end of the Jardin des Tuileries and the beginning of the Champs Elysees and since Matt had yet to see either the Champs or the Arc de Triomphe we marched on west to the Arc, stopping midway for coffee and people watching. Unsurprisingly, the Champs Elysees looked even more commercial on a Saturday then it had the day before. Nevertheless, we soaked it all in, admittedly admiring the living art more than the commercial kind. Boys will be boys, after all. Once at the Arc, we made our way, past the street of death above, through a well-appointed underground tunnel. As we emerged safely on the other side we admired the shear massiveness of the monument, like all things it was even larger up close. Having seen the Arc the day before, I let Matt wander around while I again marveled at the juxtaposition of the monument, the flutter of tourist cameras and the whirling of the Parisian street around me. Taking special note of one young British couple who were clearly more interested in each other than the rest of it all, I wondered, in ten years when they look back on this moment under the Arc, how will they remember it. Having had enough of sightseeing for the day, the two of us hopped the blue M2 line at the Charles de Gaulle – Etoile station stop and cruised back to Anvers. It was this afternoon and evening that we discovered how sensational our balcony at the hostel was. More on the Vintage Hostel later, but it’s worth mentioning here that their street-side second and fifth floor rooms all have incredible balconies. With our second floor room we had a great view of the traffic on the below sidewalk and street. 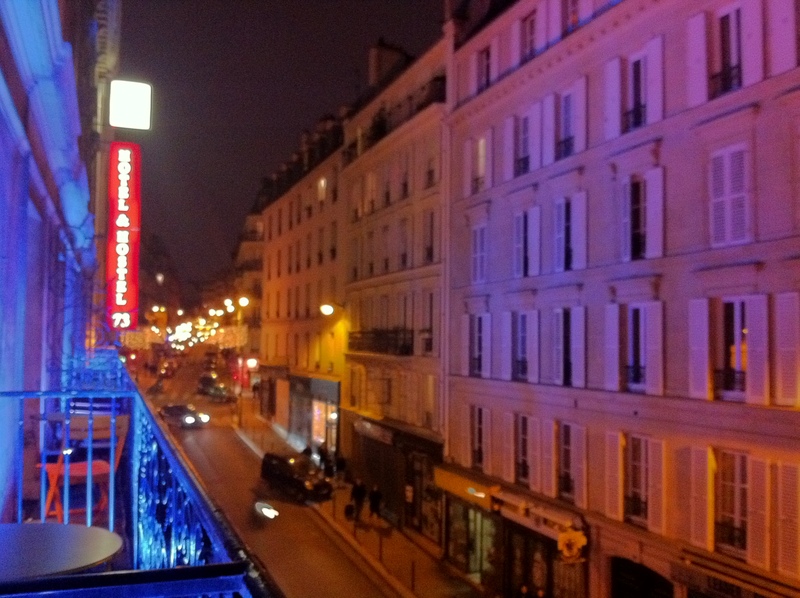 As dusk fell, the purple balcony lights clicked on, shrouding us in a glow of violet that somehow just works in Paris. Admittedly, there was more than just one bottle of Bordeaux enjoyed on that balcony over good people watching and great conversation. As it inevitably does, hunger set in again and thus we disembarked from our terrace perches in search of something more than liquid sustenance. Fortuitously, there was an Indian restaurant a block down on the right that was just within view of our stoop. Since Matt had never been introduced to Indian cuisine and I, of course, love it, the decision was a simple one. Within minutes we had descended from the incredible environment of our balcony to only be bowled over by another amazing barrage to our senses — the awakening aromas of Indian food. Disappointingly empty for a Saturday night, the locals don’t know what they’re missing out on. Though pricey for my Peace Corps budget, every bite was thoroughly worth it. Leaning back in our chairs, full of curry and garlic naan, we knew that if we didn’t rally we’d be down for the count, and seeing as it was Saturday we had to see what kind of nightlife Paris had to offer. So we settled up with our Indian host and made for the city streets. 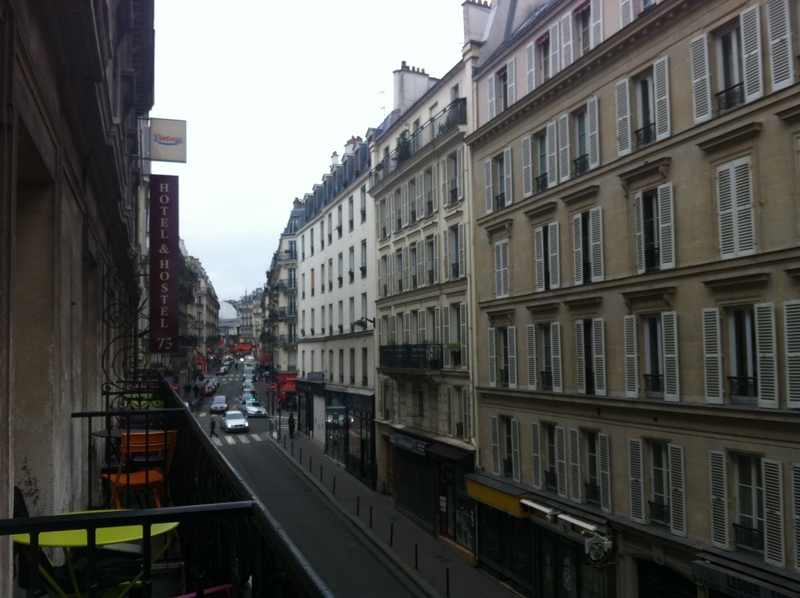 Conveniently, right next door was a small corner bar called Le Bar du Lycée. We had already wondered by several times in the past two days so thought we’d try it out. Unfortunately, our plans were almost to be thwarted, as we read a note on the door implying that the establishment was closed to a private party that evening. Again, with a mixed look of disappointment and dumb tourist we began to turn and walk away when the owner jumped out and encouraged us to come in for the next five minutes or so until the party got started. Not wanting to turn down an invitation, it is the Peace Corps way after all, we graciously accepted and saddled up to the bar. Here is the interesting thing, our five minutes quickly gave-way to fifteen, thirty and so on. The owner just kept offering us food and drinks, incredibly hospitable. As it turns out the event was a birthday party for a Parisian children’s clothing designer. With a full spread of catered food and bottomless bottles of wine the guest of honor insisted that we stay on and join them. Not only was she incredibly welcoming and obviously successful, but she was also one of the most stunning women that Matt and I had ever seen. In her mid to late twenties, she’s the child of a mixed race couple, probably African and European parents. With her hair outrageously styled in a giant Afro, and her makeup seemingly professionally done, she looked as though she had just stepped right off the cover of Cosmopolitan magazine. Though, not wanting to over stay our welcome we paid the bartender and appreciatively made our exit. 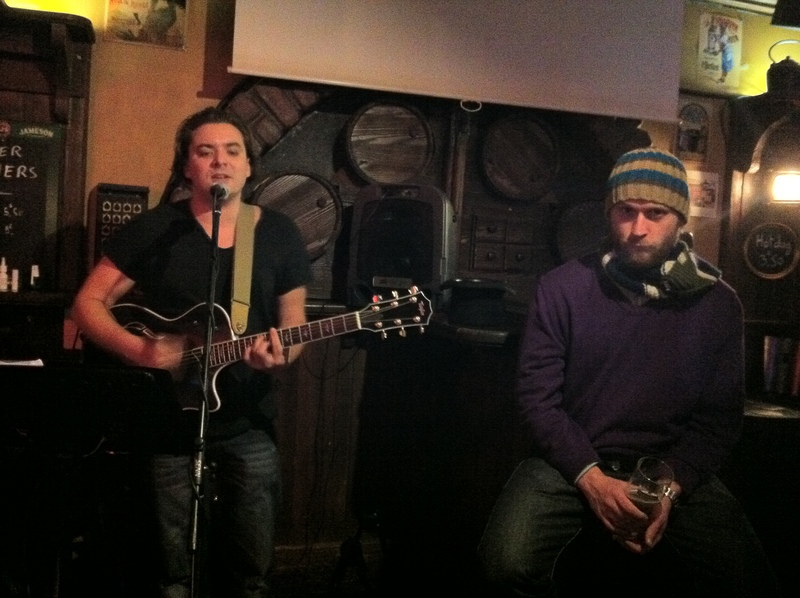 At this point, once again interested in live music, Matt steered us in the direction of the Irish Pub and who was I to disagree. Arriving just on time for the main act’s performance, we ordered a round and started making friends. It’s worth mentioning here the story behind the title for this series. As it turns out, when I am in a foreign country, for example France, where I clearly don’t know the language, I now default to Romanian (which I don’t speak well either) rather than English. Thus, as I spoke with French people throughout the week who didn’t speak English and obviously didn’t speak Romanian either, I would, to the amusement of my colleagues try to communicate in Romanian anyway. So imagine me in a French bar, looking clearly American, trying to order a round of beers in Romanian; this is my life. After enjoying the music for the rest of the evening and helping to close down the bar, we began the journey home. This is when the only other qualm I have about Paris arose; you can’t get food here after 2:00 a.m. in the morning (Matt will keenly observe that I’ve taken certain creative liberty with the daily timeline here). All of the street-side vendors, shops and restaurants are closed, and, according to the concierge at the hostel, not even delivery is an option at this hour. A quick mental note is taken; herein lays a potentially very profitable business plan. Though a somewhat disappointing note on which we ended our day the overwhelmingly positive good time we encountered throughout the rest of it thoroughly trounced this minor inconvenience. Note: If you are viewing the email version of this post please click on the blog title above to view the photographs.